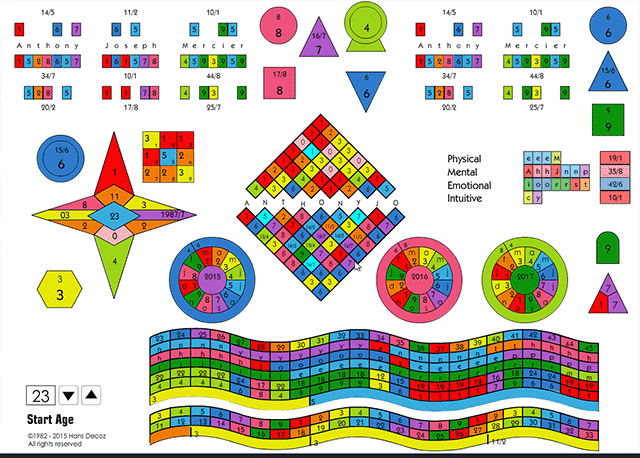 A numerology chart may look a little intimidating, but once you get used to the layout, it helps you oversee a chart in a way no other method does. You will notice that virtually every number is represented in your chart. Naturally, this can be confusing. The reason for this confusion is that we haven't learned to prioritize the relative values of each number and its position in the chart. One of the benefits of numerology is to differentiate and to reveal the many aspects of your personality and inner being. It also shows how aspects within you influence each other. What follows is a short course in how to prioritize the numbers of the chart, to discern their individual importance, and to show how each aspect of the chart relates to a specific part of your being. Next, read the Birth Day number. In order of importance, the Birth Day number belongs in fifth or sixth place, but it is closely related to the Life Path, and should be seen in connection to it. Follow with the Expression number, which reveals your talents, abilities, goals, and is particularly important in relation to career. This article was written in 1998. Since then, I have learned that a better approach, or rather, a better order in which to delineate a numerology chart is to focus first on the name numbers (Expression, Heart's Desire, Personality), because they represent the "blueprint" of the person you are - the talents and traits you came into this word with. After that, come the numbers from you date of birth (Life Path, Birth Day number, Challenges, and Pinnacles), as they reflect the "path" you walk on.